Everyone needs a set of tools, right? When I was organizing and decorating my classroom, I realized how much I needed a tool box. After quite a few hilarious mishaps using a stapler as a hammer, with thumb tacks, no less; I decided that it was time to look for some real tools. Tools are not usually pretty or fun to use. Most hammers are an ugly industrial sized shade of metal and would not be something that someone would be happy to receive as a gift. Hammer and tool shopping is not usually considered to be something fun, unless you're a male over the age of 21 by himself in Lowe's on a Saturday afternoon. But imagine my delight and surprise when I found the Handy Dandy tool set from one of my favorite designers, Jonathan Adler. This tool set is inexpensive and makes an excellent gift for someone who just moved into a new apartment or college dorm room. Of course, it’s also fabulously chic in a classroom, too! Even the gift box makes a wonderful presentation. 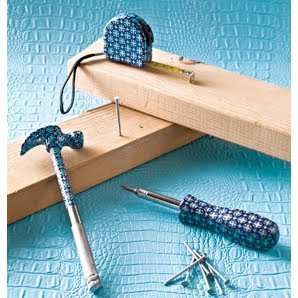 Shop here for this fun tool kit and other fun Jonathan Adler goodies.